ULISSE COMPACT DELUX is a Full HD network camera featuring the new imaging and encoding technology for outdoor surveillance that generates incredibly vivid and clear colour video images day or night. In particular, thanks to the camera’s increased light sensitivity, the DELUX technology can obtain bright images with well-defined colours in very low light conditions – even typical night-time conditions to 0.006 lux (0.0006 lux in black and white). The technology offers significant advantages for video surveillance in sensitive outdoor areas where it is necessary to identify people, objects, moving vehicles and abnormal events with the highest levels of detail possible at all times, even at night. 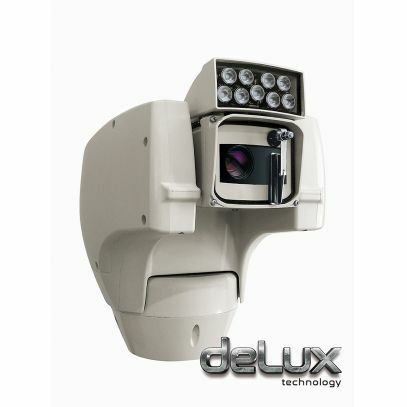 ULISSE COMPACT DELUX integrates a Day/Night, FullHD camera, 1080p with a 30x optical zoom and a frame rate of 60fps. It is capable of accurately pinpoint details in any scene – even dynamic, rapidly changing situations. In addition to improved light sensitivity, with outstanding colour rendering and greater noise reduction, the DELUX technology has brought new advanced performances to the ULISSE COMPACT, namely in the proportional zoom control and management of Privacy Masking. ULISSE COMPACT’s robust mechanical construction guarantees unbeatable performance in all weather conditions, – from -40°C to + 60°C – with a rotation speed of up to 200°/s, highly accurate preset positioning, anti-fog capability, a wiper and an integrated LED illuminator. The video images are sent via the network with compression H.264/AVC, MPEG4, MJPEG or JPEG and up to a maximum of 3 simultaneous and independent Full HD video streams. ULISSE COMPACT DELUX is the ideal solution for the surveillance of urban and industrial areas, critical infrastructures, traffic and car parks, and perimeters and borders.